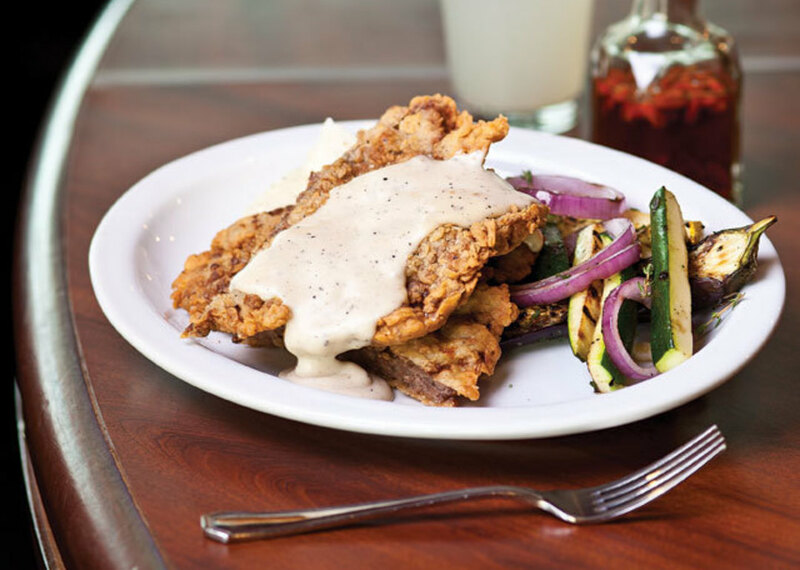 The perfectly crusted chicken-fried steak with black pepper-flecked cream gravy at Frank’s Americana Revival is a masterpiece. The crust isn’t only beautifully browned, it’s seasoned with just enough salt and pepper to give it some snap. Best of all, the coating doesn’t shatter and fall away from the steak at the touch of a fork. To truly appreciate this deep-fried artistry, get the gravy on the side and dip each crunchy bite as you cut into one of the best chicken-fried steaks in Texas. Founded by Houston restaurant legends Frank Butera and Frank Crapitto, Frank’s Chop House, as it was originally known, was supposed to be a steakhouse. But the “pretty good” steaks and chops they served couldn’t compete with the restaurant’s once-a-week chicken-fried steak and fried chicken specials. 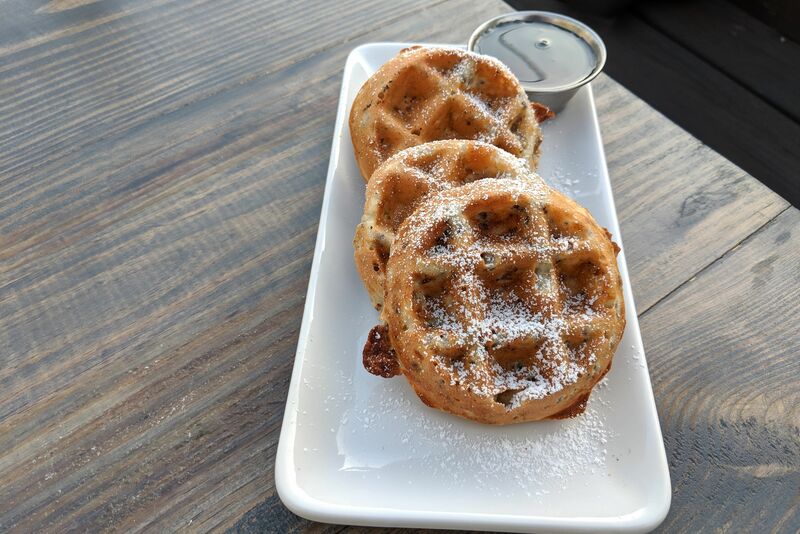 When owner Michael Shine bought the place, located on Westheimer near the Galleria, last year, he intended to change the menu and rename it “Mick and Nell’s,” after his Irish grandparents. A steady stream of loyal Frank’s customers changed his mind. Shine kept the chicken-fried steak, the fried chicken, and Albert Estrada, the chef who prepared the old-fashioned dishes so well. He shortened the list of steaks and added more lovably dated fare—meatloaf, liver and onions, shrimp and grits. And he elevated the chicken-fried steak and fried chicken to regular menu items. The design of the restaurant is elegant, if slightly odd. The exterior is decorated with steamship smokestacks, and there are porthole windows in the doors on the way to the restrooms. The vaguely nautical theme continues in the dark wood–planked walls in the dining room and adjoining bar. The classy, if incongruous, maritime design is left over from places like Rockfish and Joyce’s Seafood, long ago occupants of the location. Rather than change the handsome ocean-liner decor, Michael Shine renamed the bar the “White Star Bar,” reasoning that his grandparents Mick and Nell came to America in the 1920s on White Star steamships. It’s a creative twist on history, just like Frank’s wonderful menu. 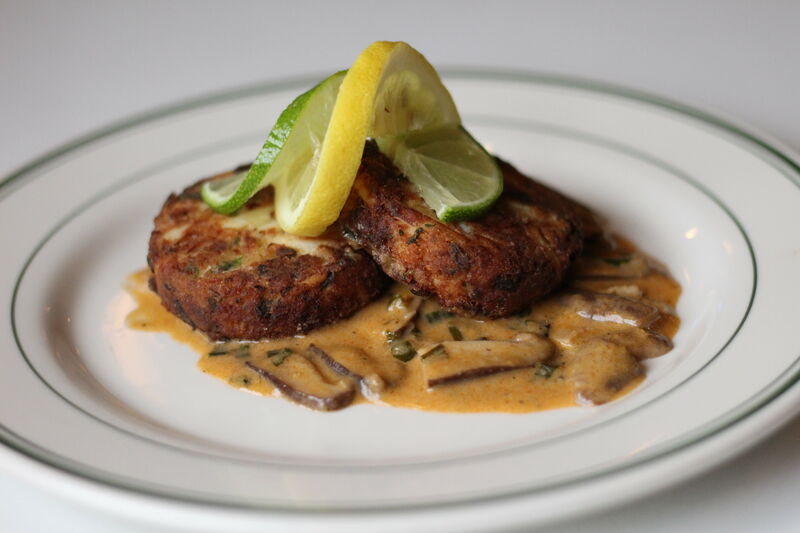 And although Frank’s isn’t a seafood restaurant anymore, there are four fish dishes on the regular menu, including a lightly crusted, but very moist, pan-seared snapper and a surprisingly delicate pecan-crusted redfish—I highly recommend both. 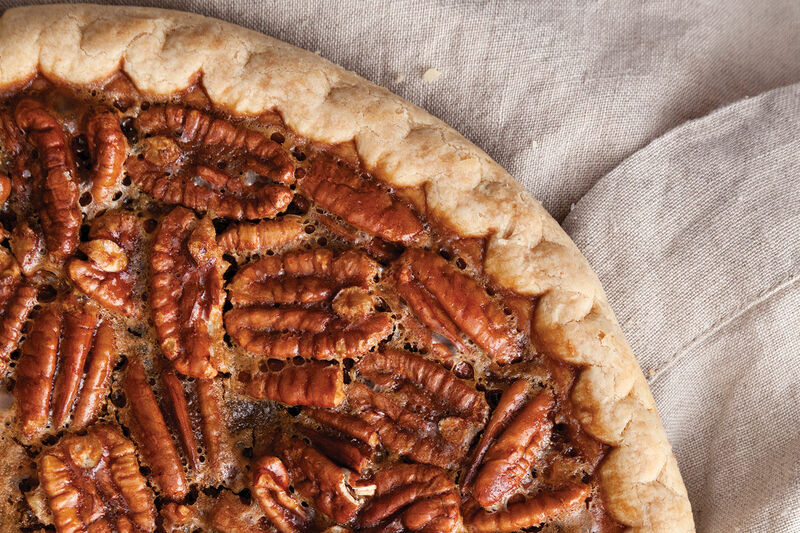 Reviving classic dishes is a natural move for Shine, who’s a Texas food–history buff. Parking his 130-year-old Texas chuck wagon in the parking lot on Friday nights during this year’s rodeo, he served “cowboy cuisine” dinners: entrees like barbecue beef short ribs with red chile pinto beans and greens, and a special cowboy version of Frank’s chicken-fried steak made with coffee-spiked red-eye gravy. When you slide into one of the restaurant’s dark wood booths, you travel back a few decades, to an era when Houston food was simply Southern. On Tuesday evenings, the chalkboard special is chicken pot pie. The pie comes to the table in an individual-size soufflé crock. After devouring a few pieces of the crunchy top crust with the creamy gravy, dark-meat chicken chunks and peas and carrots beneath it, you expose a soggy bottom crust that’s developed a dumpling-like consistency while baking. The combination of textures keeps the pot pie interesting all the way to the bottom. And on the side, there’s a chopped salad with romaine, avocado, corn, cukes, tomatoes, and parmesan ranch dressing—when’s the last time you had a chopped salad? The curry in the chicken salad has nothing to do with Indian food: it’s the extremely mild seasoning of previous generations’ Junior League cookbook recipes. That 1950s ladies luncheon favorite that mom called “stuffed tomato salad” reappears as a decoratively hollowed-out tomato filled with chopped shrimp bound with red remoulade, garnished with hard-boiled eggs, and decoratively presented on a bed of garden greens. Yes, I will have more iced tea, thank you. 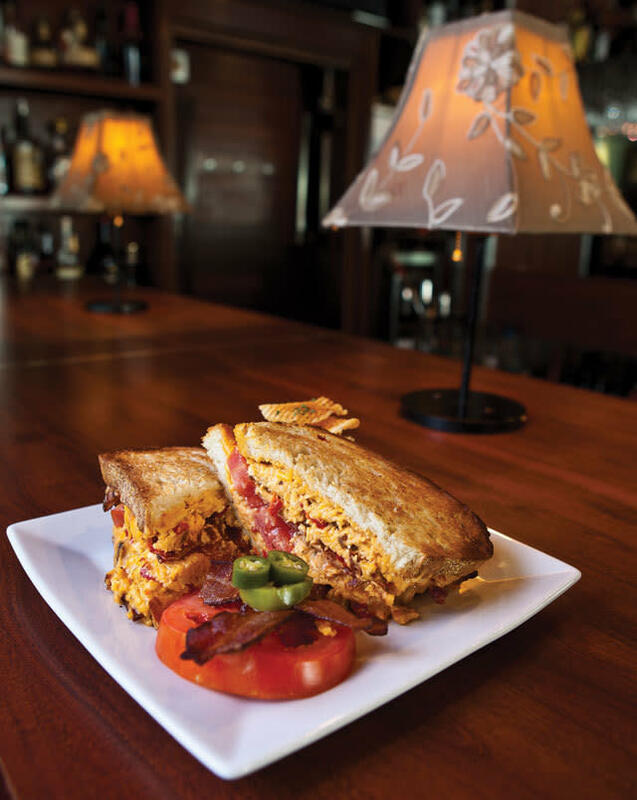 In memory, a pimento cheese sandwich is a scoop of bright orange spread squished between two slices of Wonder Bread; the one at Frank’s comes on toasted artisan bread with tomato slices and crispy bacon. There are two BLTs—one with fried green tomatoes, the other with avocado and boiled jumbo shrimp. All of these sandwiches come with house-made potato chips. It’s like home cooking, only better. Of course, you can’t expect to hit a home run on every trip to the plate. I struck out with Frank’s grillades and grits. Instead of the usual braised round steak in brown gravy, this version substitutes short ribs braised in red wine. The upgrade sounds like a good idea, and the fatty short ribs are indeed succulent. But they’re too rich for the creamy cheese grits, and the wine sauce is black, shiny, and very salty—as if the reduction process had gone too far. I ate a few bites and gave up. 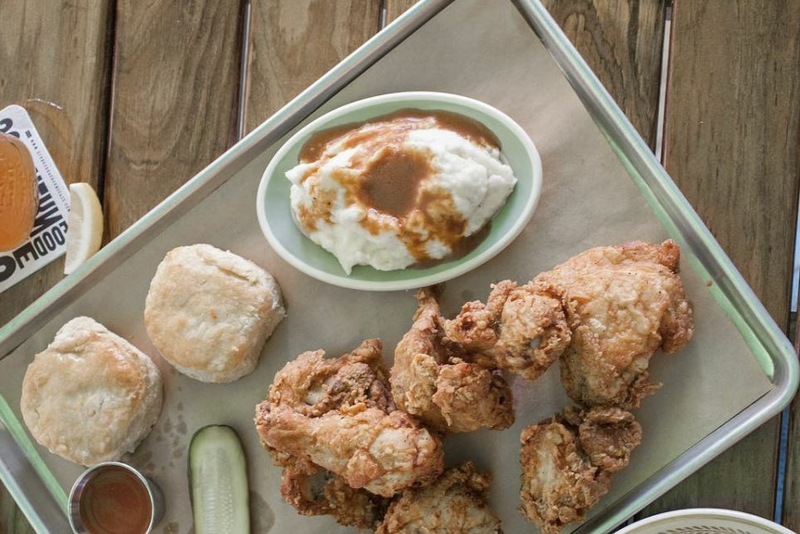 The buttermilk fried chicken is crunchy, but while the dark meat is moist and tender, the center of the breast is a little dry, and as a result, this very good example of Texas fried chicken falls just short of being counted among the best in the city. Served with whipped potatoes, sautéed green beans, and a cheddar biscuit, it’s featured on the regular dinner menu and available for lunch once a week, on Fridays. It’s a real pleasure to see this kind of fare get an upscale presentation once again. 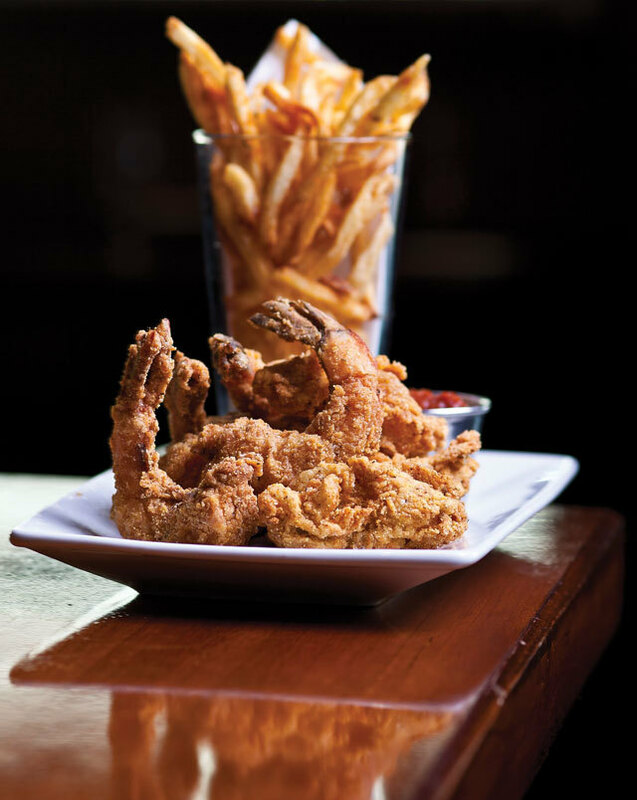 The fried seafood platter comes with gorgeously fried fish, shrimp, and oysters, but the hand-cut fries and a tangy remoulade slaw are what make it special. The dry-aged rib-eye comes flanked with that old steakhouse favorite, potatoes Lyonnaise, next to trendy grilled broccolini. The cheddar biscuits are excellent. Sometimes, you need a break from cutting-edge cuisine. Savoring the homespun innocence of a piping-hot chicken pot pie or a plate of meatloaf and mashed potatoes at Frank’s takes you back to the easy comforts of Grandma’s kitchen. And it’s also just plain fascinating to compare the nostalgic Southern flavors to the multicultural tastes we’ve become accustomed to in present-day Houston. What a remarkable illustration of how fast our food universe is expanding.